While we don't always share much in common with our neighbours to the south, you may be surprised at how many connections can be drawn between the housing markets in both countries. According to a recent study done by Zoocasa.com, residents in Canada and the US face similar issues when buying housing -- namely, incomes keeping pace with real estate prices in the hottest markets. To determine the level of affordability in each market, the study sourced December 2018 median home prices for 30 major U.S. markets and five Canadian markets (Toronto, Ottawa, Vancouver, Calgary, Montreal), then calculated the minimum income required to purchase in each city and compared that amount to the actual median income earned. The 35 cities were then ranked from least to most affordable. The results found some interesting connections between cities. For instance: Toronto, which ranked 11th on the list, suffers from unaffordability similar to Miami, Florida. "A Torontonian earning the median income of $49,495 ($65,829 CAD) faces a gap of $19,121 ($25,431 CAD), while households in the Florida city earning the median income of $33,999 fall $20,733 below what they’d need to earn to qualify for a mortgage on the median-priced home," the report says. Vancouver, Canada’s most expensive housing market (and #2 on the list overall) is compared to San Francisco, which is the least affordable city listed in the study. 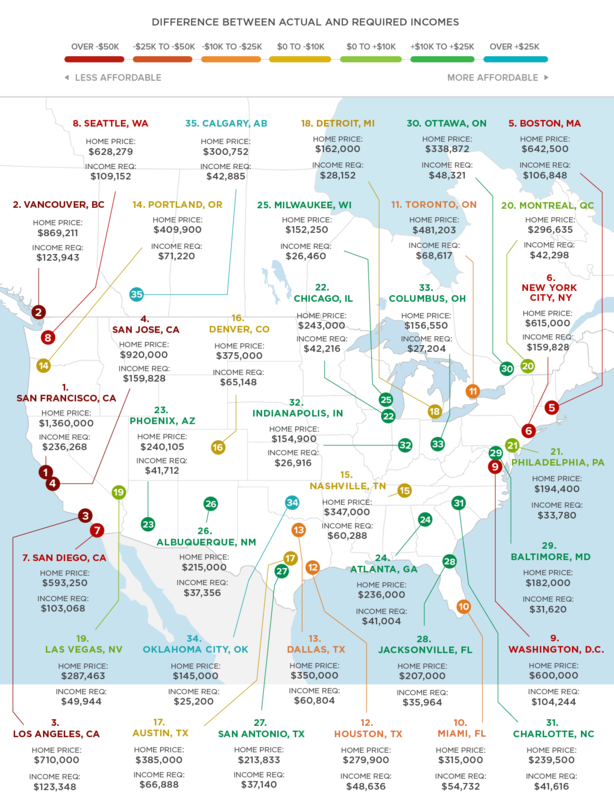 On the other end of the list, Calgary is the most affordable Canadian city and the most affordable city overall, coming in just after Oklahoma City. The top 5 least affordable and most affordable housing markets are listed below. For a more detailed look, the following map displays the cities along with the gap between the income required and the actual median incomes. The least affordable cities are shown in red while the most affordable ones are in blue. What do you think about these stats? Are they what you expected?